I'd like to add a neutral wire to an old switch box so that I can install a smart switch that needs a neutral wire. I have a mud room and porch that each have a light fixture. The lights are independently controlled by a pair of stacked switches. Both fixtures are on the same breaker. The wiring is old, and there isn't a neutral wire in the switch box. I need to verify this, but I'm pretty sure 3-wire cable brings hot, neutral, and ground up to the junction box for the mud room light, and from there the same to the junction box for the porch light. I think that neutral is then run in each junction box to each light fixture. 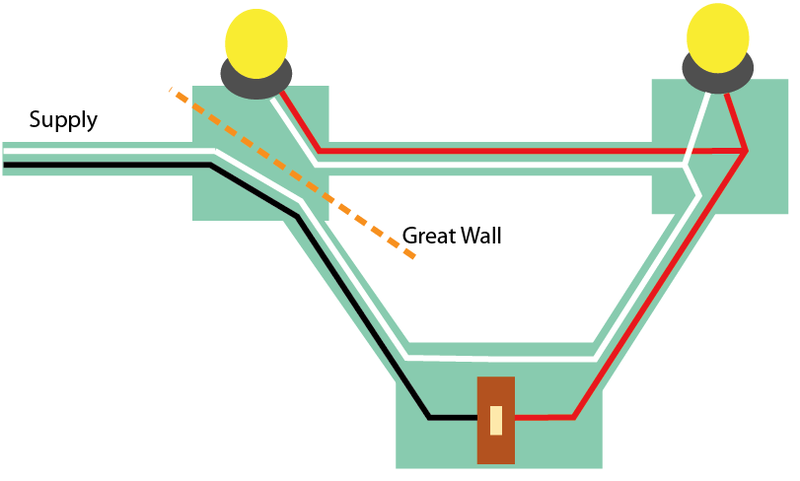 The hot is then wired with 3-wire (including ground) cable to the switch box, which sends switched-hot back via the same 3-wire cable, to connect to the hot side of the light fixture. I'd like to replace the stacked switches with a single smart switch that controls both lights (so that they would turn on/off together rather than being independently controlled). My idea is to run hot/neutral to the switch box via the cable that currently is being used to switch fixture 1. The cable that is currently being used to switch fixture 2 would continue to supply the switched hot that is necessary for fixture 2. The cable that is being used to take neutral and hot from fixture 1 to fixture 2 would then be repurposed to take the switched hot from fixture 2 to fixture 1, and to take neutral from fixture 1 to fixture 2. Does this sound code compliant, and aside from code compliance, does it sound like a reasonable idea? What you have -- ? Note that colors signify function, even though the actual cable color is whatever standard cable colors are. Here, red is switched-hot, white is neutral. You can't cross the streams - er, send current going in a loop. This is AC. It'll do bad things. A basic rule is that currents must be equal in each cable or conduit. Think about an army of ants exploring a tree. Anywhere on the tree, if you count the number of ants that went up a branch, the same number will come back down. Currents are equal in tree topology - but branches can't touch. If an ant goes up one branch and comes down another, currents are not equal. Hence, circuits must be a rigid "tree" topology and loops must be prevented. 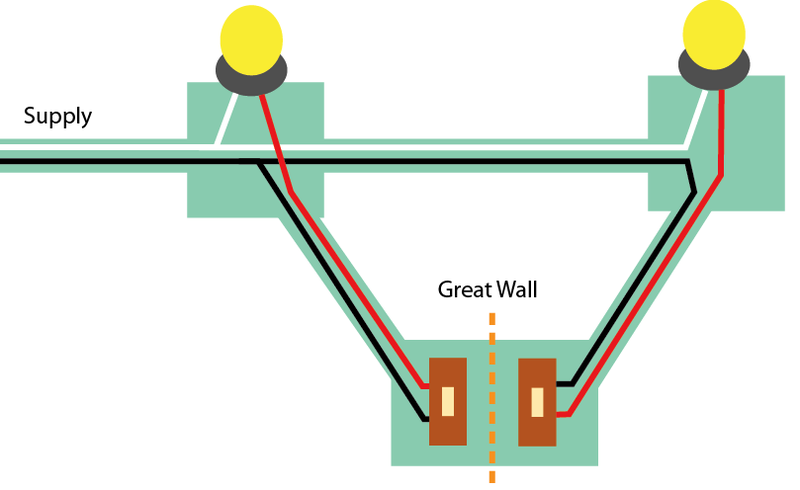 You see in the first drawing where there's a "Great Wall" separating the two switches. So we do the following. See how neutral goes a bit farther, but this avoids sending current in one direction around the triangle, and it is a tree (vine, anyway) not a loop. **Notice how you will have two separate neutral splices in the left box. Don't combine them and don't mix them up! Not the answer you're looking for? Browse other questions tagged electrical wiring switch light-fixture neutral or ask your own question. What wiring do I need for a fan/light/night-light fixture? How do I wire a double stack switch? How can I add a new light fixture off of a ceiling fan wired to two switches? Is it OK to use 12-3 awg to wire a ceiling fan and light? Can I connect unused ceiling fan wire with neutral? How can I continue a circuit from a light switch through a light using 12/3 cable?